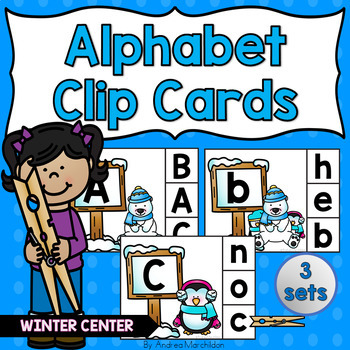 These winter themed Alphabet Clip Cards are perfect to help your students identify uppercase and lowercase letters in the alphabet. You can choose from 3 different sets of cards. Just print, cut, and laminate the ones that will work best for your students. Students can use clothespins to clip the correct letter on each card. You could also just laminate and have students use a dry erase marker to circle the correct letter. It is your choice! It makes a great center for your preschool and kindergarten learners. Set 1: Match the uppercase letter on the winter sign to the matching uppercase letter in the box. Set 2: Match the lowercase letter on the winter sign to the matching lowercase letter in the box. Set 3: Match the uppercase letter to the matching lowercase letter. 9 Alphabet Worksheets are also included! Just look for the green star next to my store logo and click it to become a follower.